Ultrasonic sensors operate with a piezoelectric transducer as the sound emitter and receiver. A patented de-coupling layer in special material is used to decouple the ultra-Sonics to the air - an acoustically thin medium. This ultrasonic transducer is embedded, watertight, into the sensor housing, in polyurethane foam..The transducer transmits a packet of sonic pulses and converts the echo pulse into a voltage. The integrated controller computes the distance from the echo time and the velocity of sound. The transmitted pulse duration ∆t and the decay time of the sonic transducer result in an unusable area in which the ultrasonic sensor cannot detect an object. The ultrasonic frequency lies between 65kHz and 400kHz, depending on the sensor type; the pulse repetition frequency is between 14Hzand 140Hz.The active range of the ultrasonic sensor is referred to as the sensing range sd. 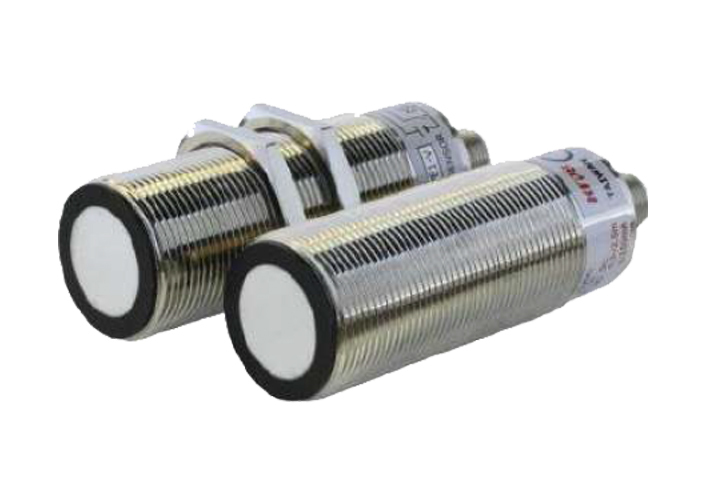 This range is bounded by the lowest and highest sensing distances, whose values depend on the characteristics of the transducer. The highest sensing distance is given in the type code. The ultrasonic sensor detects objects within its sensing range, regardless of whether these objects approach the sensor axially or move through the sound cone laterally. Ultrasonic sensors are available with switching outputs and/or analog outputs, various output functions are available ac-cording to type. The ultrasonic beam has an opening angle of around ±5°. The sound pressure level outside of this cone is less than half (-6dB) that of the value on the sensor axis. The opening angle defines the spatially dimension of the sound cone.